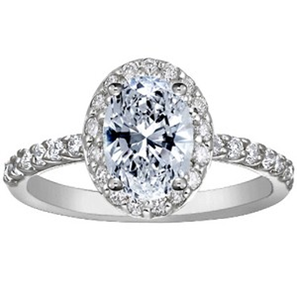 Oval Diamond Engagement Rings – Browse our selection at Juno Jewelry! It may come as no surprise that engagement rings are serious business. With a huge variety of styles to choose from, the task can seem daunting, and you may be wondering how you’re ever going to whittle down the choices enough to locate the ring of her dreams. Fear not. Certain styles of engagement ring are making a huge comeback. Although this shape of diamond fell out of the mainstream trend for a while, Oval diamond engagement rings are now popular as ever, and there are plenty of gorgeous styles to choose from to ensure you find the perfect one for your bride-to-be. Oval diamond engagement rings are a premium choice for more reasons than one. Not only are they extraordinarily sparkly, but they also boast a larger surface than their round counterparts. For instance, an average 1 carat oval diamond has a 10% larger surface area than an average 1 carat round diamond, proving that a larger diamond isn’t always more expensive. Oval diamond engagement rings can also make the appearance of fingers more slender due to their elongated shape. Although round diamonds are the most brilliant of all diamond shapes, oval diamonds are cut the same way and thus provide a similar outstanding brilliance with a more unique appearance than traditional round cuts. Whether your bride is in her 20s or her 60s, she is sure to appreciate the stunning shape and sparkle of oval diamond engagement rings. Oval diamond rings provide loads of other perks. Though they are rarer than other cuts of diamond, they are often less in demand. You needn’t increase your budget to purchase one of these dazzling sparklers. There many affordable options to choose from in selecting the oval diamond engagement ring of her dreams. Even Kate Middleton is in on the trend. She is currently sporting a sapphire oval diamond engagement ring, one that once belonged to the late Princess Diana. This ring will go down in history as one of the most famous rings of all time. Elegant, chic and classic, this gorgeous shape will remain popular for many years to come. Although oval diamond engagement rings are complemented by a variety of settings, there are a few who truly bring out the best in this unique shape. A stunning halo of pavé-set accent gems makes a center oval stone appear larger than normal. You might also consider setting your oval cut diamond sideways so that the length is parallel to the band, an unusual twist on this classic style of ring. Juno Jewelry is devoted to providing a superior customer service experience for its beloved customers. In addition to a gorgeous, extensive selection of oval diamond rings, diamond band engagement and wedding rings to choose from, we offer affordable pricing, a quality guarantee and a warm and friendly staff to accommodate any questions or concerns you may have regarding our collection. Call or order from Juno Jewelry online today to begin the process of selecting the engagement or wedding ring of her dreams.